Your new boat mattress topper (also called a pillow top) will provide an added layer of comfort. They are made with a layer of foam and a quilted mattress fabric, similar to a pillow top on a regular mattress. Each topper is made from a custom template to match the top shape of your boat’s mattress and is held in place with elastic straps. 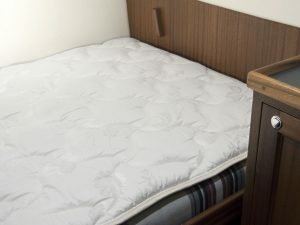 A mattress topper is often less than 25% of the cost of a new mattress or boat cushion, offering a less expensive solution to an improved night’s sleep. For boats with multiple cushions for a bed, the mattress topper bridges across those areas where the cushions meet, making them disappear – no more sinking between the cushions.